I love all of my colorful t-shirts but I wanted to make them a little more fun by adding some words. I can't believe you would expose something so personal though; that you like hugs? That is crazy. that is so amazing! i love the Hugs one =] what a beautiful, colorful collection of fun! I am not a t-shirt fan but I must admit, these personalized ones are lovely! I like the 'I like hugs' and the picture of you is so sweet! Love your color t-shirts, and the words add that special extra touch. In the first picture, the I Like Hugs shirt is folded and I was like, DOES THAT SAY 'I LIKE SOUP'? Love them!!!! I think you should sell them....as a mystery though. 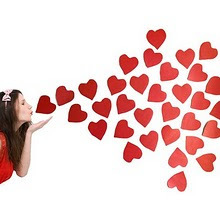 We tell you our size and send $ and you send us whatever sentiment you want to. Wouldn't that be fun? 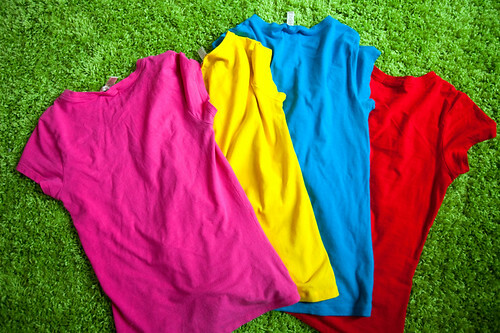 I have so many solid colored t-shirts-- what a great idea. Where did the letters come from? and "I love hugs" is my favorite (although I love the person who thought it said "I love soup". I definitely don't like soup). la dee da is my fav. absolut my fav! @Danielle- That is such a fun idea! I definitely want to start selling things. I just need to get more organized and start setting everything up! @anne elise- I just found the letters at a little art store around here. Extremely cute. I love this idea!!! Adorable! You have the best ideas. where did you get the t-shirts? i'm always looking for colorful tees. Awesome! You are so creative, I'd love to see what else you do! I LOVE the i <3 brooklyn one. They look great! Love them. Those are lovely! I admire your creativity. Adorable. Love the color of the shirts. super cute idea! i love your blog. always makes me smile. :) you inspire me to blog! You are amazing! Every time I read your blog you make me smile! love the t-shirts! the girls who live above my shop will probably copy that idea. like they copied your chalk footprints a couple weeks ago .... (see pics at www.jolihomeandevents.blogspot.com). P.S. Kiki (my cat) says hi to Moo. @ Emily- I bought them at a store called Rainbow. They sell colorful t-shirts for only $5! a very good idea for the afternoon! what does the blue one say? i cant quite see it. im loving the 'la dee da', makes me think of lou reed! These are so cute! What a fantastic idea!! I hope you have a fun week! love it! i used to stencil shirts for me and my friends that had our favorite expressions on them, like 'mount up' and 'i'm kind of a big deal' =) makes me want to make some new ones. fetchin' adorable, is all i have to say. what are you shooting on? i've kind of been creepin' up your blog and your photog is legit. I love all those bright colors--only I can't read what the last shirt said, mind helping me out?? i like the t-shirts.. are greits!! i like the color blue!! You -- and Moo -- radiate pure joy. It’s a very good post I have come across.I really like this post very much.It’s a very appreciated post.Thanks for sharing.Keep blogging. I'm not from U.S and I'd like to know how to get these lovely letters or how can I do it myself? I love the colours. All are so fresh and spark. 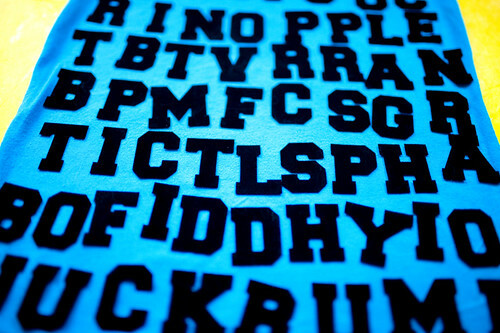 i want all these t-shirts :.